Utah rocks – quite literally! 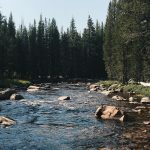 During our USA road trip, we drove through this gorgeous state and tried to soak up as many views as possible. Not only did we manage to do everything we planned on doing (Canyonlands, Arches, Monument Valley, Bryce), but we managed to squeeze in a few extras which were more than worth our time (Dead Horse Point State Park and Mesa Arch). Today I share with you the must-sees of Utah, plus some dinner and hotel recommendations in this Utah travel guide! First stop – Canyonlands National Park. Utah’s largest national park turned out to be the perfect place to start our drive through Utah. It gives a great first impression of what’s out there waiting for you in this American state. We drove the route by car, picking out some of the viewpoints to enjoy the scenery. 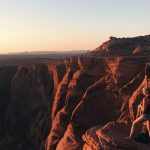 After our drive through Canyonlands, we continued our trip to Moab, where we stayed the night. In Moab, we stayed at Expedition Lodge, which was perfect for an overnight stay. Before going to Moab, we even got to see our first natural arch in Canyonlands. Arches national park is located only 5 miles from Moab, which is why we visited it twice. In the evening we drove to the Double Arche (picture above), where we watched the sunset. Even though we weren’t the only ones with the idea of watching the sunset at these two arches, it was incredibly beautiful. And my god, they make you feel small. The next day we went back to Arches (after watching the sunrise from Dead Horse Point State Park – more info on that later) and took our time to drive through the park. We were able to stop at all the points and enjoy the sights of these beautiful natural arches. For the diner and Instagram lovers; Moab Diner is a must. Not only can you take adorable pictures in front of the sign and inside the diner, but the food is a perfect example of American cuisine. Dead Horse Point State Park was one of the things we didn’t plan into our trip – but boy, am I glad we made the rushed decision to go. Because it’s not too far from Moab (33 miles, about 40 minutes by car), we drove there first thing in the morning after waking up very early. Watching the sunrise there before breakfast wouldn’t mess with our other plans, which is why we were in the car by 5 AM. This turned out to be one of the best decisions we’ve made; the sunrise was magnificent. This state park turned out to be one of the most beautiful things I have ever seen in my life. It’s hard to explain the feeling of looking over a canyon this big. It literally takes your breath away. What definitely amplified the experience was that we were the only ones there. The early alarm might have scared some people off, but the silence of nature we experienced at the edge of this massive canyon can barely be put into words. Tip: Try to be there before sunrise and watch the sun come up – there will be barely anyone there (we were the only ones there), plus the sunrise gives the canyon a gorgeous red glow. Dead Horse Point State Park: UT-313, Moab, UT 84532. After visiting Dead Horse Point State Park, we drove on to see Mesa Arch (about 20 miles). Mesa Arch is known to be one of the most “most beautiful” arches in Utah. From my own experiences, I’m not sure if I agree with this statement, though. It was definitely a beautiful arch, but I can’t say the arches in Arches National Park were any less beautiful. What did make Mesa Arch worth the drive, was the gorgeous view over the canyon behind it. Tip: Early morning is a great time to visit Mesa Arch. And with early I mean, before or just after sunset. Avoid the crowd and enjoy the beautiful view. A Utah travel guide wouldn’t be complete without the famous Monument Valley. Known for its special rock formations in the American desert. Some of you might think “but Monument Valley is located in Arizona, right?” And you’re right! A big part of Monument Valley is indeed located in Arizona, but we entered the park right before the border between Utah and Arizona. After paying a visit to the visitor center, we started our valley drive. The best view is located just outside the visitor center, where you can look over the valley and see some of the most famous mesas. A very sandy road which connects the main view points in the valley. I have to say that I was very glad I didn’t have to drive – the sand and the hills that were a little bit too steep for me to drive on! I’m quite sure you could also have a guide drive you through the valley, in case you don’t want to drive yourself! Monument Valley is one of those “crossing it off my bucket list” kind of places and with good reason. It’s absolutely gorgeous. The thousands of years that have slowly broken down the sand and stones to create something like this, it’s hard to take all of that in. Especially when you’re there, facing it in real life. The last national park we visited in Utah was Bryce National Park. Even though it was the last park in Utah, it wasn’t any less impressive. I can’t get enough of those enormous, wide open spaces filled and shaped by nature. There’s something quite magical about it. We drove through the park ourselves again, following the main route while stopping at certain viewpoints to take some photographs and hike up a few hills for even better views. The many sandstone sculptures don’t seem to stop. They’re spread out over such a big valley, that it feels like there are millions. Some stops you really shouldn’t miss while at Bryce: The Natural Bridge (photo below), Far view Point, Sunset and Sunset Point, Bryce point and Inspiration point. My time in Utah was short but filled with these beautiful sights. Unfortunately, we weren’t able to visit Zion National Park because we arrived too late. Hopefully, I get another chance to visit it someday (the parking space is very limited and cars were stood there most of the day because you had to take a shuttle bus to the actual park). Thank you for reading this Utah Travel Guide. For any questions, please leave a comment below or send me a message! Have you ever been to Utah? What’s your favourite place there? If not, which of these would you like to visit most? Thank you so much! Really hope you get the chance to go sometime, it’s so beautiful! These are some really stunning pictures! I didn’t know much about Utah but I definitely have some places to add to my bucket list now. Okay, WOW. These photos are something else. This is stuff you see in films, not in real life! There’s a few places in America I’d love to go but Utah never crossed my mind. It has now! Your photos are so stunning! I’d have never picked Utah as somewhere to visit but those photos of Dead Horse Point State Park have me convinced that it’s somewhere I need to go and that diner looks so cute! Thank you so much! I honestly never really thought about visiting Utah until we planned it into our road trip. We didn’t even plan to go to Dead Hores Point State Park until we had some extra time to spare and it ended up being one of the most amazing things I’ve ever seen! Stunning! Some lovely photography and nicely written. Looked like an amazing landscape too!! Thank you! 🙂 Glad you enjoyed the post! Looks like a beautiful trip! Love the photos! I would love to travel to Utah after seeing this. Looks amazingly beautiful. Thank you! You really should if you ever get the chance, it’s such a beautiful state.